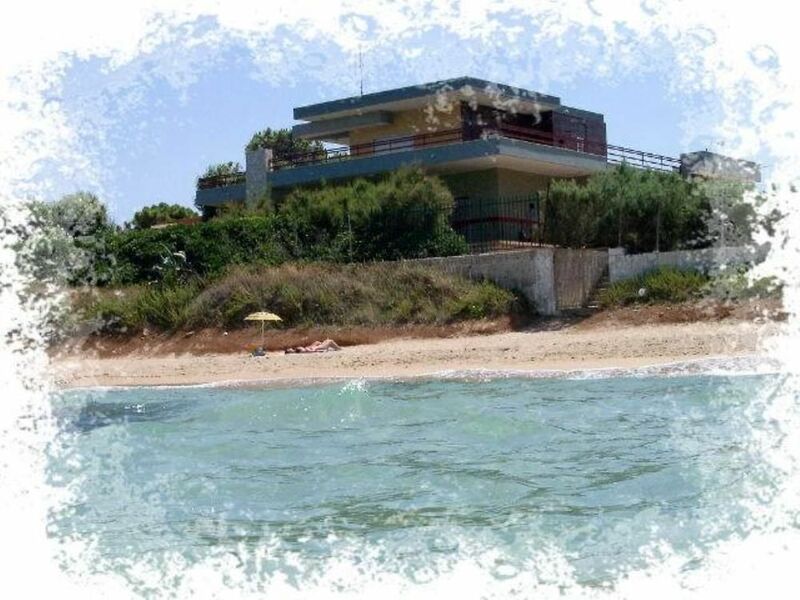 PUGLIA - VILLA ONLY 20 M TO THE BEACH!!!! For rent, a holiday apartment situated on the 1st floor of a large family villa. This elegant and confortable apartment with 55m2 of accommodation includes double bedroom, kitchen-lounge with two single sofa-bed, a bathroom and 300m2 of terrace with fantastic sea- views. The position, as you can see from the photographs, is excellent with the sea only 20 m from the apartment. The sea is clean and the beach, accessed directly from the house, is mainly sandy although there are rocky areas 250 m away. There is parking for one car. Sorry but no pets. It is very close to the main tourist attractions of Puglia: Castellana Grotte (15 km), Alberobello (20 km), Zoo- Safari - Fasano (5 Km), Bari (40 km), Matera (50 Km), Lecce (100 Km), Trani (100 Km). The closest airports are Bari Palese Airport ( 55 Km) and Brindisi Airport (60 Km). for its unique position only 20 m from the sea ..... for its terrace overlooking the sea with magnificent sea-view .... for the warm hospitality ... for the proximity to the main places to visit. sea ​​sun .... ... puglia: fell at home! "We can only fully recommend Villa Capitolo. The house is situated directly at a nice sandy beach. There is even a private access to the beach. A huge terrace is around the house, so that - weather permitting - you can have sun or shadow as you like, all day long. The villa is very tastefully furnished. All what you may need is there. The owners were very friendly and provided us with lots of hints for nice places to eat and to visit. A large shopping center is a mere 10 ... 12 minutes drive away - very convenient. There are a number of very nice and interesting places to visit in relatively close proximity, so you don''t need to waste your precious vacation time for driving long distances. We have already decided for a second time there." "Everything was lovely...and our hosts were warm-hearted and friendly. The beds were not comfortable, but otherwise the apartment contained everything we needed - even coffee for our first breakfast! And it was very clean. It is situated on a quiet beach front, with plenty of wind and fresh air! We had some trouble finding restaurants and grocery stores, so some previous research into this would be advisable." "The house is exactly what it promises, very beautiful! Be prepared for some nightlife noise during the weekends in high season." This is a lovely base for a holiday in Puglia, the view from the terrace is even more impressive in reality than the photos, the sea is lovely, by day and night and there are lots of interesting towns to visit nearby. The apartment is ideal for a couple. As well as the food, sea and sun, the best thing about Puglia for us was the friendliness and helpfulness of the people and the owners were no exception. The family is extremely warm and welcoming and we were made to feel very welcome here and hope to return soon as we feel we have made real friends. Over the years we have visited almost every region in Italy and this is a place we really look forward to returning to.La panoramica della terrazza è veramente stupenda, il mare è pulito, la famiglia della casa è molta simpatica, ci siamo trovati proprio a casa li. Vicino ci sono qualche bar e ristortanti ma seguendo i consigli della familglia entro 5 mn. in macchina siamo trovati altri posti dov’è è possiblile mangiare bene. L’ubicazione è ideale per fare sia giri a Locorotondo, Martina Franca, Alberobello, Ostuni ecc o passare dei giorni al mare. Credo che sia un posto meraviglioso e speriamo di tornare ancora. "The accommodation is idealy suited to a couple with a limited budget holidaying in Pulia. The location and views could not have been better: quiet neighbourhood, comfortable accommodation, beautiful views owerlooking the sea, beach only a stones throw away, close to some wonderful fish restaurants, beautiful rustic countryside and historic architecture. We would not hesitate to recomment Villa Capitolo." (Text automatically translated) Take the motorway and exit at Bari Nord Follow the direction TOAST and after the various outputs follow the signs for Monopoly CHAPTER, arrived at the intersection with the coast, turn right for Savelletri. The villa is right there on your left at 50 m (sea side). RECEIVE BY E-MAIL MAP EXPLANATORY.